Anyone got any experience of playing one? Have you had a bash on an axe with mini humbuckers? They are quite different and arent for everyone. 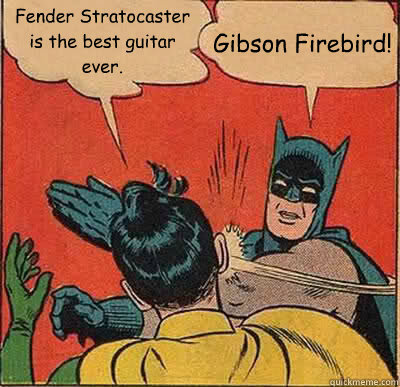 If you're used to a les paul, and the boosted mids and grunt they usually bring, a firebird will be quite different. Not bad different of course! Never played one but they look so good. I think when you play a firebird though you've got to have the stage moves too! Nice wide stance, plenty of head banging. Dave Grohl often plays one, James Hetfield, lots of metal guys, but then again so does PJ Harvey. I think it's the thinking man's 'Flying V'! I'm more blues/soul influence, don't play anything heavy as such. Remember steve craddock live with weller playing the solo to You Do Something To Me on a firebird years ago and I've always liked them since. This is the one I was considering, only problem living in hull is there are no decent guitar shops to go try some out. It's rare to see anything above tanglewood in stock here! Steve Craddock!!! You have to watch this video if you haven't seen it. Very funny. I love the guy and his playing, but this video just cracks me up! Too cool for school and then ..... whoops!! Fair play to him, he actually gave permission for that clip to be put on youtube. How many other people would have just buried it!